New research suggests that dietary fiber impacts gut health in some surprising ways. Most fiber-rich foods have some of each. Bran (the outer coating on whole grains), fruits, and vegetables are great constipation fighters, but fiber supplements of cellulose and psyllium have also been found to be effective. Just be sure to drink plenty of fluids when increasing fiber intake. Diverticular disease. It’s not uncommon for small pouches (called diverticula) to form in the wall of the colon. Most people with diverticulosis, as this condition is called, have no symptoms, but 15 to 20 percent may develop diverticulitis, a painful inflammation of these pouches. While not all research agrees that a high intake of dietary fiber prevents diverticular disease, a study that followed over 46,000 men from 1986 to the end of 2012 found that a Western dietary pattern (high in red meat, refined grains, and high-fat dairy) was associated with a higher risk of developing diverticulitis than a diet high in fiber-rich fruits, vegetables and whole grains. Colorectal cancer. Some large studies have suggested that fiber, especially from whole grains, may lower risk for developing colorectal cancer. 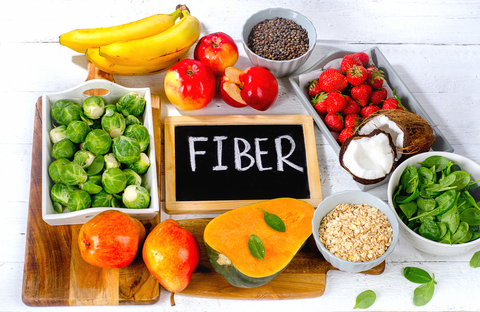 While the American Cancer Society does not think there is sufficient evidence yet that fiber itself lowers risk, diets high in fiber-rich foods (like fruits, vegetables and whole grains) and low in red and processed meats apparently do. Intestinal lining dysfunction. Like the nasal passages, the walls of our intestines hold our first line of defense against invading pathogens. Keeping the lining of our intestines healthy is essential to protecting our overall health, and fiber can help. The fiber we eat feeds many of the billions of microbes living in our intestines. Keeping our microbial friends well fed and happy may be key to keeping our intestines healthy. When the microbes munch on fiber, they release short-chain fatty acids (SCFAs), which provide fuel for intestinal cells and help create an environment that’s more attractive to beneficial organisms, and less hospitable to pathogens like salmonella or E. coli. When mice in two new studies were fed a low-fiber diet, the overall population of beneficial microbes shrank, and the make-up of that population changed. At the same time, the mucus layer of their intestine thinned, allowing the bacteria to get closer to the intestinal wall. Without an adequate mucus layer, even beneficial gut bacteria can trigger an immune response in the intestinal lining. A hallmark of immune reactions is inflammation. After just a few days on a low-fiber diet, the mice in the studies developed chronic inflammation. After a few weeks, they began putting on fat and developing higher blood sugar levels. When mice on a generally un-healthy high-fat diet were given fiber, they fared much better. “It’s really important to get plenty of fiber from fruits and veggies, whole grains, and other plant sources,” says Davis. Whether it’s helping your gut operate smoothly, or feeding those beneficial gut microorganisms, the gut-health-boosting fiber in delicious, nutritious plant foods is just one more reason to enjoy them in you diet. Tags almonds, bacteria, blood sugar, blood sugar levels, cancer, chronic inflammation, colorectal, colorectal cancer, constipation, dairy, diet, digestive, digestive health, diverticulitis, diverticulosis, e coli, fiber, fiber rich foods, gut bacteria, gut health, health, healthy gut, inflammation, mucus, nutrition, nuts, refined grains, short chain fatty acids, spinach, sugar, sugar levels, supplements, vegetables, whole grains.